A Borders councillor has been referred to a standards ombudsman after allegedly acting in a threatening manner towards two women at a community council meeting. East Berwickshire councillor Jim Fullarton has been referred to the commissioner for ethical standards in public life in Scotland, Bill Thomson, following an incident at Eyemouth Community Council in January 2018. Mr Fullarton is alleged to have responded to questions from community councillors Jan Weeks and Lucy Anderson regarding his perceived inaction to investigate complaints, with increasing aggression, including standing up and shouting, banging his fists on the table and making derogatory comments. 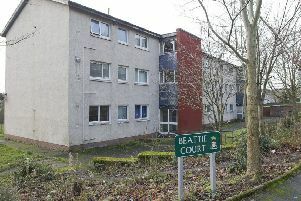 Community council chairman James Anderson, was present at the meeting and he said: “He’d been asked for two years to look into complaints received by the community council about Berwickshire Housing Association. “At the meeting, we asked him ‘have you been in touch with them?’ and he admitted he hadn’t. “He started arguing with Jan Weeks and Lucy Anderson. He started jumping forward and punching the table in front of Jan. I shouted at him, and he stopped. At this point, Jan was hiding behind me. “When he didn’t get his own way, he stood up and started thumping the table. Mr Anderson, Ms Anderson (no relation) and Ms Weeks have all submitted complaints to Scottish Borders Council regarding Mr Fullarton’s behaviour. In her statement, Ms Anderson writes: “He was derogatory when addressing me and I felt he was also being aggressive to the point where he was banging his fists on the table. Commenting afterwards, Ms Anderson said: “I suffer with anxiety, especially in situations where I feel confronted or where someone is being aggressive towards me, which councillor Fullarton was during that meeting. “It really has affected me as I struggle to be in the same room as him which, at some meetings I have to, and I try not to let what he did stop me doing my job as a community councillor. Even walking past him in the street makes me very nervous. “He just thinks he can get away with it, and I’m not going to stand down till he is reprimanded for what he has done. Ms Weeks’ complaint reads: “On January 29, 2018, at the monthly meeting of Eyemouth Community Council, I was very disappointed and offended by spurious remarks made by councillor James Fullarton toward myself, as well as banging his fists on the table and shouting at myself. “He stated, while debating with myself on the matter of himself not following up on complaints about Berwickshire Housing Association repairs, that I was a moaning old woman. “He later admitted that he had not followed up on any complaints requested to be made by Eyemouth Community Council to Berwickshire Housing Association. “His tone was demeaning and quite nasty, and I felt he was bullying people around the table by talking over them continually and banging his fists angrily on the table while shouting. “I feel this is in breach of the councillors’ code of conduct and should be disciplined accordingly. When asked about the incident, Mr Fullarton declined to give his side of events, saying: “This complaint has been looked at by Scottish Borders Council’s standards department, where it was considered that there was no case. “The town council decided to take the complaint to the Scottish standards commission. The complaints were originally assessed by the council’s director of regulatory services, Brian Frater, and he decided against pursuing the matter further. In a letter to the community council, he wrote: “It is clear that there are different interpretations regarding a number of the allegations that have been made and different views as to what has caused the tensions which exist. “What is not in dispute is that matters have deteriorated to a level that is having a significant adverse impact on the relationship between some members of the community council and councillor Fullarton. “Councillor Fullarton has stressed that it has never been his intention to show disrespect to any member of the community council and he is sorry if his frustration at the January meeting was perceived as being aggressive or intimidating. The community council has now referred the complaint to the commissioner itself, although the details of the complaint and the minutes of the meeting are already in the public domain. In his own complaint to Scottish Borders Council, Mr Anderson wrote: “It is felt that a public apology for his comments and questionable verbal conduct toward female members of Eyemouth Community Council is needed. “This would be the minimum action needed to resolve our continued offence due to councillor Fullarton’s erratic behaviour. “We, as a community council, must work side by side with councillor Fullarton and we have persevered over six months to try and make our meetings work. “However, his behaviour has become more and more erratic and comments more spurious as time goes on. “We are aware any complaint will taint any support he will give us in the future. “However, we do not feel supported by him in general so now have decided we have nothing to lose by asking Scottish Borders Council to step in and address the issues. “As chair of Eyemouth Community Council, it is with a heavy heart I support the complaints by Jan Weeks and Lucy Anderson against councillor Fullarton. Mr Thomson will now look into the case before coming to a judgement.